If you’re looking for the best place to plan your perfect family holiday then Pembrokeshire might just be the perfect spot for you. A great beach is the starting point for any golden memory and Pembrokeshire has the well-deserved reputation for our wonderful coast line – don’t believe us? Just ask National Geographic! You can read about there top-rated coastal destinations in the world here. So, you’ve found your way to Pembrokeshire, you’ve got the family in the car, you’ve not had to worry about Passports, or Travelers Cheques. You’re on a low-stress holiday and now you’re just looking for a beach to lay your towel and don your wetsuit on. So, where are the best beaches in Pembrokeshire? 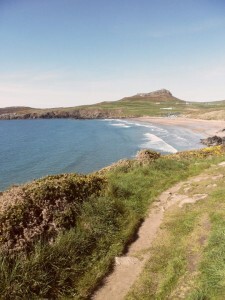 Whitesands Bay has all the facilities and amenities you’d want from a beach. With easy disability access, a large carpark, a well-established cafe, toilets, ice-creams, and full lifeguard over the summer months you’d be hard pressed to find a more accessible and family-friendly beach. Local Outdoor actitivity centers also have surf, and other watersports equipment for hire right on the beach, just in case you’ve forgotten your wetsuit! However don’t let the full list of facilities put you off. Once you walk onto the white sands of Whitesands you’ll understand why it is one of the most popular beaches with families and surfers alike, in the area. With a large beach, soft sand, and wonderful views of Ramsey Island and St. Davids Head it’s a great place to spend the day! Barafundle Bay is a National Trust beach situated in the Stackpole Estate. It is only accessible by foot, which means it is often more quiet than other local beaches. Parking up in the well maintained National Trust Carpark you need only follow the spectacular coast path for about ten minutes to find one of the closest spots to paradise without having to travel by plane. White golden sands, high sand dunes, and beautifully clear water await you. The National Trust cafe on the Quay here also serves a great crab sandwich! And the near-by Bosherston Lily Ponds combines make for an incredible day out. Another beach accessible by foot Druidstone Haven is one of the quietest beaches on this list. With great rock-pools it’s a fun place for kids, and a local stables often arranges pony treks across the sand which are great to join or simply to watch. With the Druidstone Hotel at the top of the nearby cliffs why not treat yourselves to a slap-up meal or an ale in their beautiful cliff-top beer garden. If you’re staying with us at Ocean Haze and don’t fancy the bigger crowds at Whitesands then 20 minutes along the coast path from there you’ll find Porthsele – also accessible by road, you have to park and pay in Pencarnan campsite and follow a short path to the beach. Porthsele has the same white sands as Whitesand but on a much smaller scale. There is a small fresh-water waterfall on the cliffs that kids love! Porthsele is a great place to relax, it’s also a beautiful spot at sunset with wonderful views over to Whitesands, Carn Llidi and Ramsey Island. If you’re after a picture-perfect seaside beach then Tenby South is the one for you. With a mile and a half of sand, dunes, and an ice-cream van you’ll be set for a great day out. There is parking, and a park and ride service. During the summer months it is also life-guard covered. The ice-cream coloured hotels and buildings of Tenby, and the town itself make for a great family day out! If you’re after some more information about the beaches we’ve mentioned, or if we’ve whetted your appetite take a look here, with loads of beach ideas and information on other activities you and your family can enjoy on your Pembrokeshire holiday! With all these beaches an easy distance away Ocean Haze provides family accommodation, self-catering accommodation, disabled access self-catering accommodation, and disabled access bed and breakfast accommodation and to top it all is a great place to stay in St. Davids – Britain’s smallest city. We can help you plan and book your perfect Welsh holiday, and you’ll need a soft bed to lay your heads and a tasty breakfast to get you started in the morning we offer a great Bed and Breakfast service. Or if you want to create your own haven of tranquility then our self-catering accommodation may well be for you. If you’d like more information on places to stay in St. Davids, or our self-catering accommodation or bed and breakfast accommodation then please don’t hesitate to contact us.